Hino Australia today announced a new three-year extension of its partnership with the Virgin Australia Supercars Championship. Utilised as a platform to generate brand exposure and engagement with its dealer network and customers, Hino says the existing Supercars partnership that began in 2016 has played a key role in its marketplace success. “I am very pleased to confirm that Hino has extended its partnership with Supercars for a further three years,” said Bill Gillespie, Hino Australia’s General Manager of Brand and Franchise Development. “Our Supercars partnership has delivered everything we wanted to achieve, and more, which is not surprising given that racing is in our DNA. “We credit the Supercar involvement with delivering a level of brand and dealer engagement that has been a key factor in strengthening our status as the fastest growing truck brand in Australia. “Our relationship with Supercars also provides us with a unique opportunity to promote our Hino Advantage suite of business solutions, including our unique capped price service offer." Hino has been appointed again as the Official Light & Medium Duty Truck and Bus Sponsor for the Supercars Championship. It now adds status as the Official Towing Vehicle at Supercars-promoted events including Bathurst, Sandown, Gold Coast, Townsville, Newcastle and Sydney. “Hino has been a long and fantastic partner, we are delighted to continue the relationship for another three years,” Supercars CEO Sean Seamer said. 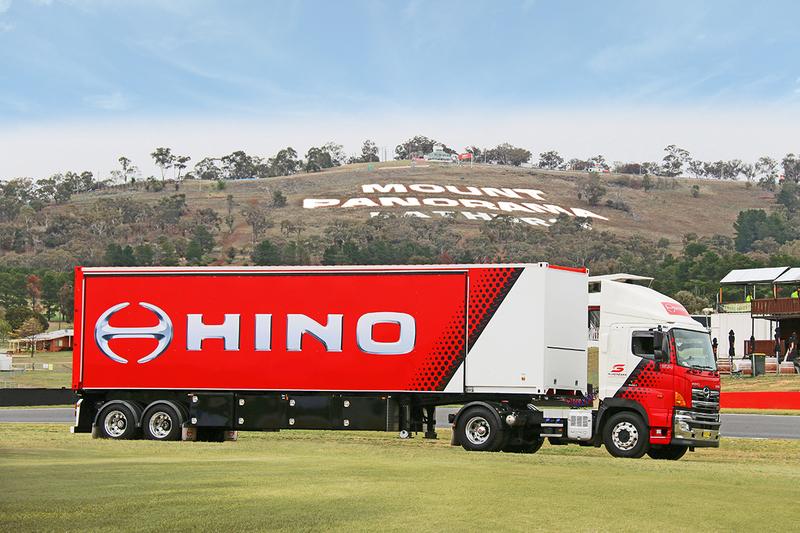 Hino will continue to be very visible at Supercars events; its Hino Hub providing regular race information and statistical updates throughout the Foxtel and Network Ten television broadcasts, as well as strategic trackside signage. “Safety Car rides and pre-race grid walks are other benefits of the partnership that enable us to offer a memorable trackside experience to our customers and our dealer network, which is very powerful and important tool for us in this business-focussed investment," Gillespie added. “Given the demographic profile of Supercars, whether live at track, through TV or online, this partnership connects with our customers, and we look forward to another successful three years. “It’s an exciting time at Hino with today’s announcement, continued monthly sales success, and the upcoming launch of the 500 Series Standard Cab model in November 2018."